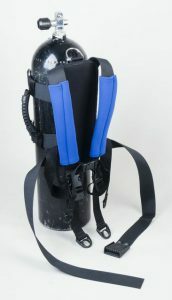 For sport divers, drysuits offer a warm advantage that can be used to extend the diving season – possibly all year – and to extend the amount of time divers are actually able to spend in the water. 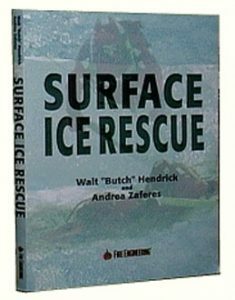 For public safety divers who are often faced with contaminated water diving, though, drysuits are more than a luxury. Public safety divers must wear drysuits all year ‘round. Because they wear them for every dive, and because they must be able to respond and dive rapidly for a rescue/recovery, public safety divers become well-rehearsed in easy and rapid drysuit donning. 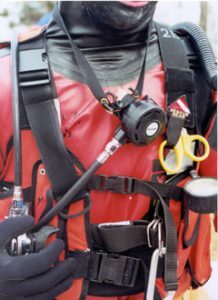 Many of the techniques they use for donning suits can be used by all drysuit divers. I often watch drysuit divers, especially those who do not get the opportunity to dive every week, perform what sometimes resembles a wrestling match while donning their drysuits. Many end up exhausted and drenched in sweat once they finally get the suit on. 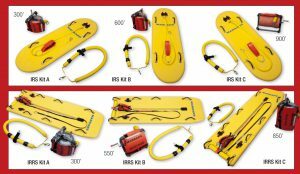 To help drysuit divers, both new and old pros, here are a few quick hints that we use with our public safety diving drysuit students. First, let’s start with the zipper wax you use. Even though the manufacturer may supply beeswax, you should throw it away. Beeswax is sticky, and will collect dirt that can destroy a zipper’s teeth. Instead, use paraffin wax (available in grocery stores), which will not collect dirt, will not build up around the zipper, does not melt, and is self-cleaning. (As proof of the benefits of using paraffin, I recently retired a Viking drysuit after 18 years and hundreds of dives. After 27 patches, the suit would no longer hold air – but the zipper was still airtight.) Use your paraffin before storing the suit, and touch it up before a dive. Second, learn to treat your seals with care. Seals can be fragile, yet are often the most difficult portion of a drysuit to doff and don. Before you don a seal, first warm it up by gently pulling it open several times to stretch the material. 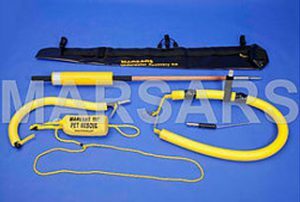 Stretching seals in this manner will reduce strain on the material. If you dive with the neck seal turned in (like a reverse turtleneck collar), turn the seal in before you stretch it, and keep it that way as you stretch and then don the seal. With a little practice, the neck seal will be properly set as you put it on, so you do not have to waste time and effort trying to situate your neck seal. When the time comes to remove your drysuit, again you should be careful with your seals. While many drysuit divers simply grab their neck seals and start yanking, there is a better method. IF the hood is an attached dry one, then put it on. Place two or three fingers inside the neck seal on either side of the chin, and pull the seal outward as you drop your chin through the seal. Lift the seal up and over your forehead, keeping your hands together. This trick will reduce neck strain and will prolong the life of your seals. Third, learn to stay cool. Because they wear drysuits even in summer, public safety divers can still find themselves sweating inside their suits even after using proper donning techniques. Worse, because they often must sit topside as back-up divers, public safety divers often cannot get in the water quickly to cool off. To cool them down, we teach this trick: use a finger or two to open your neck seal, and then press the suit’s inflator button for about 30 seconds. At most you will use 50 psi from your tank, but will lower the temperature of the suit considerably. Better than simply opening a suit zipper, this technique works well for cooling overheated divers.